Are you still lolling on your couch in a Thanksgiving food coma? Brace yourself! Chanukah and potato latkes hit this weekend and then comes Christmas, followed by New Years. 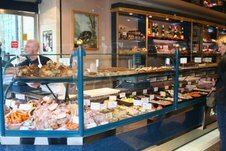 You need a culinary break. A meal that will feel refreshing with bright flavors. A meal that will give your overworked tummy a bit of a reprieve from richness but still leave you satisfied--even happy. That's where spring rolls come in. They're fresh and light. They're pretty easy for home cooks to make. And they really pack a lot of flavor in a convenient package. Spring rolls can be found across Asia. But I'm going to share with you the Vietnamese version made by Duy Nguyen, the owner of the relatively new and delightful Bánh Mì Hôi An on Rosecrans in Point Loma. I was introduced to it by my friend, chef Jack Monaco, and immediately set about organizing a cook date with Nguyen, which Jack also participated in. 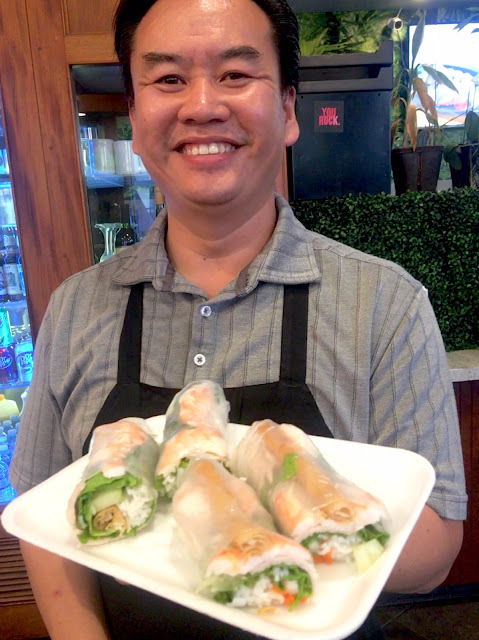 Nguyen, who opened the restaurant in July, is a long-time enthusiastic home cook. It started back in the '90s when he was a student at UCSD. His dish was pasta and his roommates were grateful. Then he started gathering Vietnamese recipes from his mother, who was from the French resort town of Dalat in a mountain region near Saigon. Nguyen himself left Vietnam with his parents when he was 11. He had grown up under the communist regime and, not surprisingly, was taught Russian in school as a child. His father, an officer in the South Vietnamese army, was sent to a re-education camp for six years. The family spent the five years trying to escape Vietnam and when they were caught, the child Duy was jailed for what was perhaps a few weeks. He can't really remember. The family finally was able to get to Thailand in 1986, escaping through Cambodia via a fishing boat, and they stayed in a Thai refugee camp for about a year before moving on to the Philippines. "We were placed in a refugee camp near the U.S. base," Nguyen explained. "The orientation was on American life so we would be acclimated when we finally arrived." By then he was 15 years old. 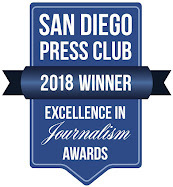 The family settled in San Diego where extended family had already moved, and Nguyen eventually enrolled in UCSD as an engineering student before switching to economics. He pursued a career in management consulting, working in the oil and gas business. After earning his MBA at Cal State San Marcos, Nguyen worked for a debt management company, all the while cooking at home, for church fundraisers, and family parties. It took a leap of faith, but he chucked his management job and opened his fast casual restaurant last summer. Bánh Mì Hôi An, of course, features banh mi sandwiches on the menu. 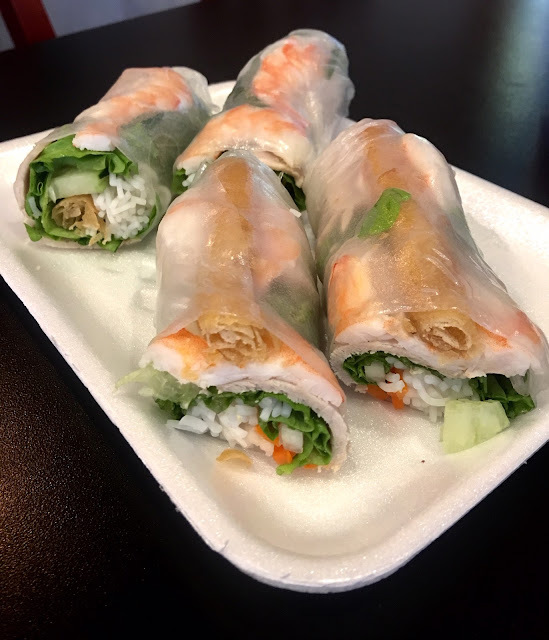 But there are also a variety of vermicelli salads, grilled meats served with jasmine rice, spring and summer rolls, pork skewers, marinated tofu, crispy fried chicken wings, and a fabulous cold cut sampler plate--with the cold cuts all house made. But let's stick with the spring rolls. It can be overwhelming for the unfamiliar to figure out which brands and products to buy. These are what Nguyen recommends. You can find them at Vietnamese markets or 99 Ranch Market. 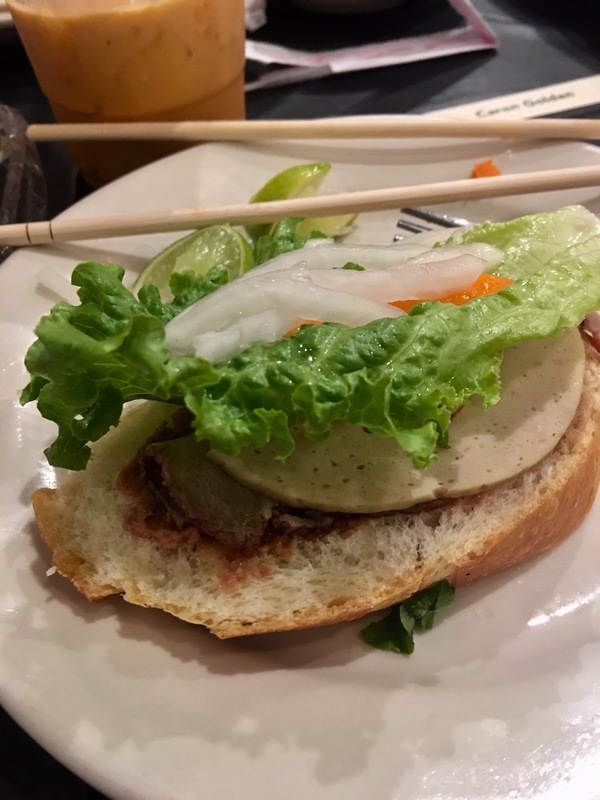 Among the ingredients you'll need are rice paper, 41-50 size shrimp, pork loin, vermicelli (rice noodles), green leaf lettuce, mint leaves, and, if you like, bean sprouts, whole chives, cucumber, carrots, peanuts, and daikon. Want to add some crunch? Pick up some egg roll wrappers, roll them individually and fry them. Oh, and to make it easy to get the size uniform, pick up an 8 X 10-inch cutting board with a ridge around the edge. Nguyen uses one, placing the ingredients between the ridges to keep them the same size. You have to work fairly quickly on spring rolls, so you'll want to have everything prepped and ready to go. The vermicelli needs to be cooked like pasta in salted boiling water for about 20 minutes. 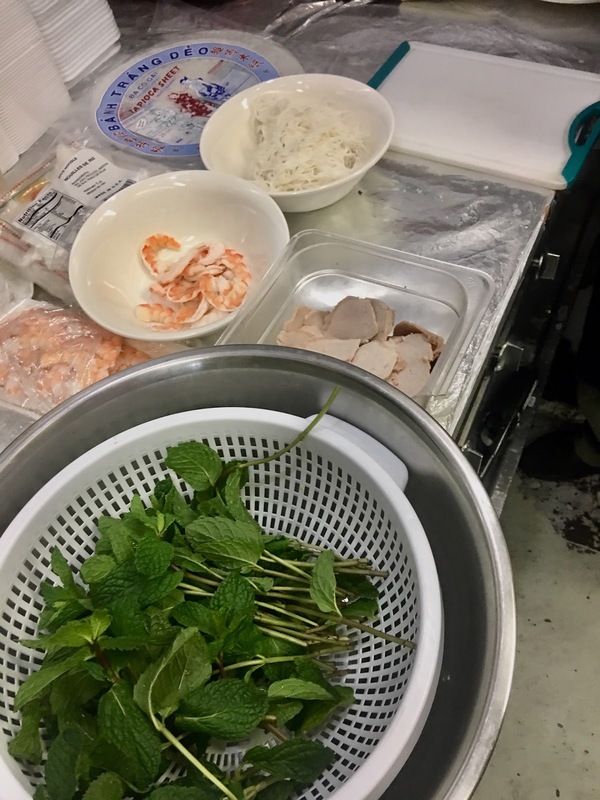 You'll want to bring another pot of water to the boil to cook first the shrimp and then, with the addition of salt and fish sauce, the pork loin, which will boil for about 15 minutes. You could also substitute the pork with chicken and instead add a couple of slices of ginger. And, don't toss the liquid after you've cooked the meat. It's the makings of a great soup, Nguyen said. 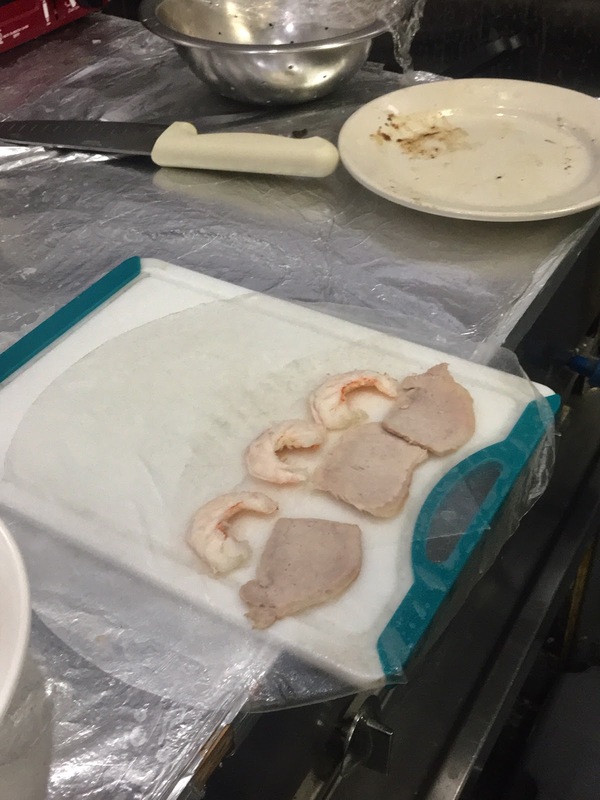 Once everything is prepped and laid out--you'll have sliced the shrimp in half lengthwise. sliced the cooled pork, keep the rice noodles in a bowl covered with plastic wrap, fill a large bowl with hot water for dipping the rice paper, and have your herbs and vegetables prepped--you can get to the filling and rolling. 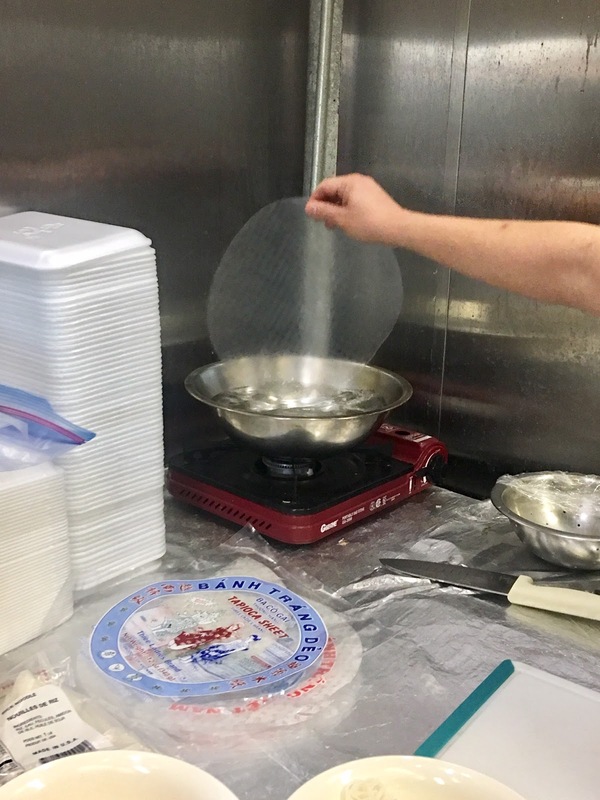 Step one is a quick dip of the rice paper into that bowl of very hot water. Dip it and do one turn. Your goal is to keep it stretchy, not soggy. Then place the rice paper on the cutting board. Layer three shrimp slices, the outside on the bottom, then three pork slices below. Top with a leaf of green leaf lettuce, then four mint leaves and whatever other herbs or vegetables you like and/or the fried egg wrapper--just don't overfill. You'll end with about 1.5 ounces of the cooked vermicelli spread across the other ingredients. I still need practice. I made the long one in the middle. Now you need a couple of dipping sauces. Nguyen shared both his peanut sauce and nuoc cham, which are very simple to make. One last word about the spring rolls. If you're not going to serve them immediately, roll each in plastic wrap so they won't dry out or stick to one another. Here's a tip: fold the edge of the plastic wrap back and over so you'll have an easier time finding it and unrolling it. Bring a large pot of water to the boil. If the shrimp is raw, add them briefly until they turn pink. Remove and let cool. Add the fish sauce and salt to the water and add the pork loin. Boil for 15 minutes, then remove and let cool. Bring another pot of water to the boil. While the water is heating, rinse the rice noodles in cold water until the water runs clear to remove starch. Boil the vermicelli per the package directions. Remove the noodles from the water, drain, and place in a bowl. Cover with plastic wrap. Slice the shrimp in half lengthwise and thinly slice the pork loin. Set aside. Set out the rest of the ingredients you're going to add to the roll. In a bowl of very hot water, dip then turn one sheet of rice paper. Place on a cutting board. Start layering, first with three pieces of shrimp across the center of the wrapper, outer side on the bottom. Then place three slices of pork across the rice paper just below the shrimp. Top with the leaf of lettuce, mint leaves, bean sprouts, egg roll wrappers, or whatever else you want, and finally the vermicelli. Gently pull the bottom of the rice paper up and over the ingredients and firmly tuck in. Then start rolling. Pull in each side to the middle and finish rolling, tucking in as you continue. Think of it like rolling a burrito. Set aside until you've made all six. Then serve with sauces or wrap in plastic and refrigerate. Whisk ingredients together or blend in a blender or small food processor. When ready to serve top with Sriracha sauce and crushed peanuts. Peanut Sauce will be good refrigerated for a week. This is a very versatile sauce. Not only is it a great dipping sauce but if you add some oil and more vinegar you have a salad dressing. Or, as is, use it to pickle vegetables. Mix together ingredients. Add chili paste to taste when serving at the table. Can last for months refrigerated. 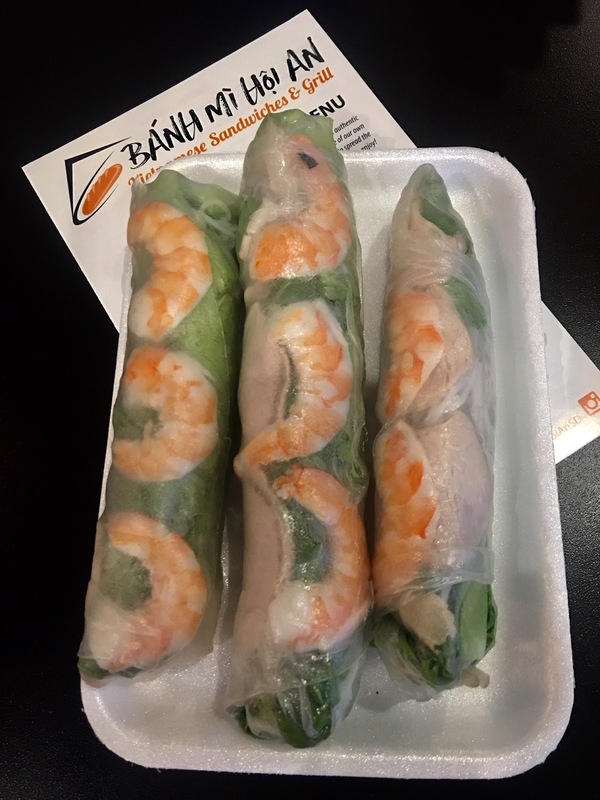 Bánh Mì Hôi An is located at 3145 Rosecrans St., Suite A in Point Loma (next to the Bookstar bookstore). I live in a community in which neighbors know each other by the alleys they live on. It's rare to go to someone's front door here. All the action is in the alley. The kids play there. Puppies learn to walk on leashes there. You go to borrow a cup of sugar or drop off a mis-delivered package through the alley. So, it's natural that it's where we celebrate major holidays. Last Sunday night we held our annual Alley Thanksgiving and about 20 people, including all the little kids--and some of the grown kids--showed up for the ultimate potluck. A juicy smoked turkey. 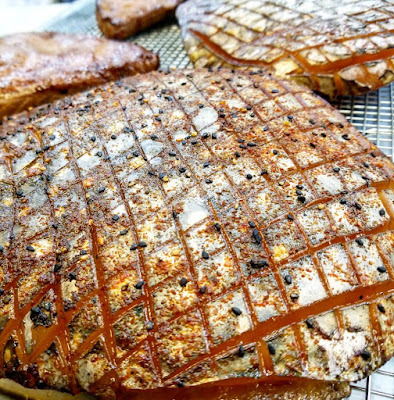 Honey-baked ham. Stuffing, of course. Lots of rolls and lots of salad. String beans. And, I brought the mashed potatoes. Normally, mashed potatoes isn't something I make, particularly for a crowd. It's a whole lot of carbs. But I'm not hosting Thanksgiving this year and my mom, who loves to make mashed potatoes, won't be making them. So I decided to step up with them for our Alley Thanksgiving. Who better to turn to than Evie for a primer on making them for a crowd? My mom believes in using russets, not Yukon Golds. They mash more smoothly, she says. 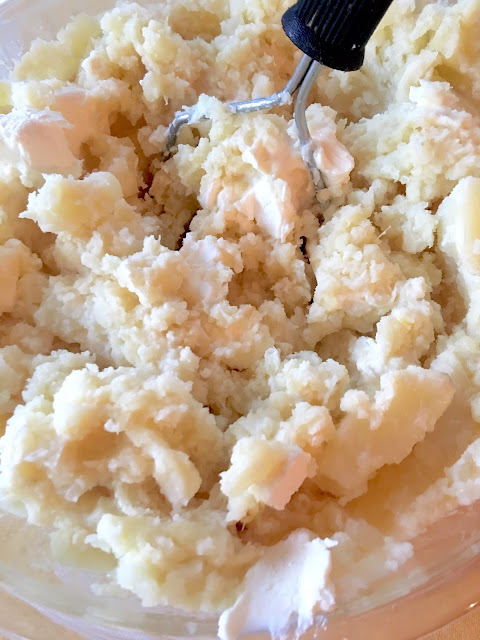 She uses butter, cream cheese, and evaporated milk to get just the right consistency and boosts the flavor with roasted garlic and the oil they roast in, as well as a big helping of grated Parmesan cheese and some salt. As a dish to make in a hurry, it's close to being that. The prep is easy; it's just waiting for a large pot of water filled with peeled and quartered potatoes can be a finger-tapping experience. So, go do something else in the meantime. 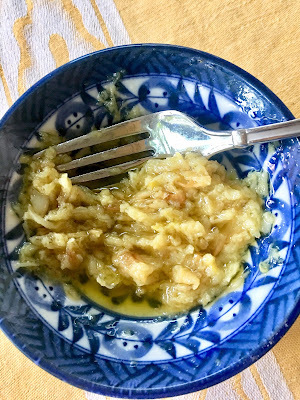 Now, the good thing about this recipe--other than how deeply luscious and delicious it is--is that you can improvise a bit based on your own tastebuds. Add more garlic or leave it out entirely. Add herbs (I garnished the top with chives from my garden). Add a different grated hard cheese. Or no cheese. Add pepper, of course. Add boiled, peeled celery root. So, riff on this as you will, but with this recipe you have a foundation for your own version of perfection. I returned home with just enough to share with Mom. Pre-heat oven to 400°. Slice off top of the garlic heads enough to just expose the cloves inside. Place the garlic heads on a piece of foil, drizzle them with olive oil and wrap in the foil. Place in the oven and roast about 30 minutes, until cloves are just browning and tender. Remove from oven and let cool. Squeeze each clove into a small bowl, add the olive oil from the foil and a little more if necessary and mash. Set aside. Put potatoes in big pot of cold salted water to cover. Cover loosely and bring to the boil. Turn down heat and simmer until soft. Remove from heat and drain the water. 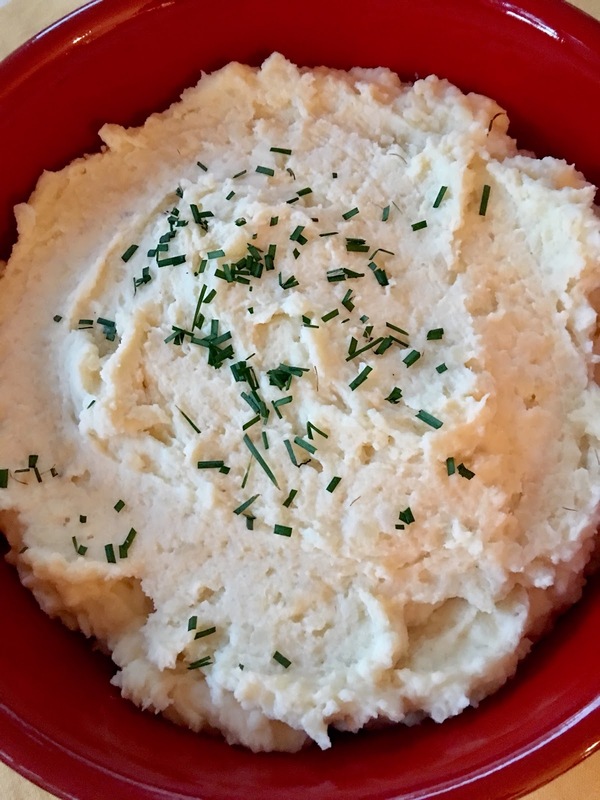 Put potatoes in a large bowl with butter and mashed garlic. 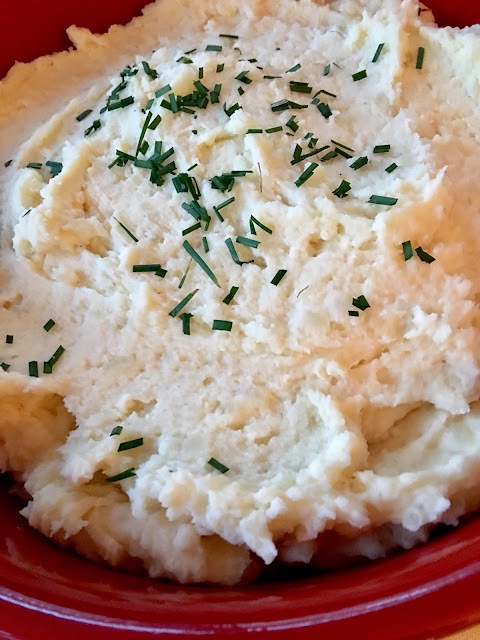 Start mashing and stir in cream cheese while potatoes are still hot. Then gradually add evaporated milk and continue mashing until the potatoes reach the consistency you want. Mix in Parmesan cheese and salt to taste. Can be refrigerated and reheated in microwave. Keep additional evaporated milk in case you need to thin it out after reheating. 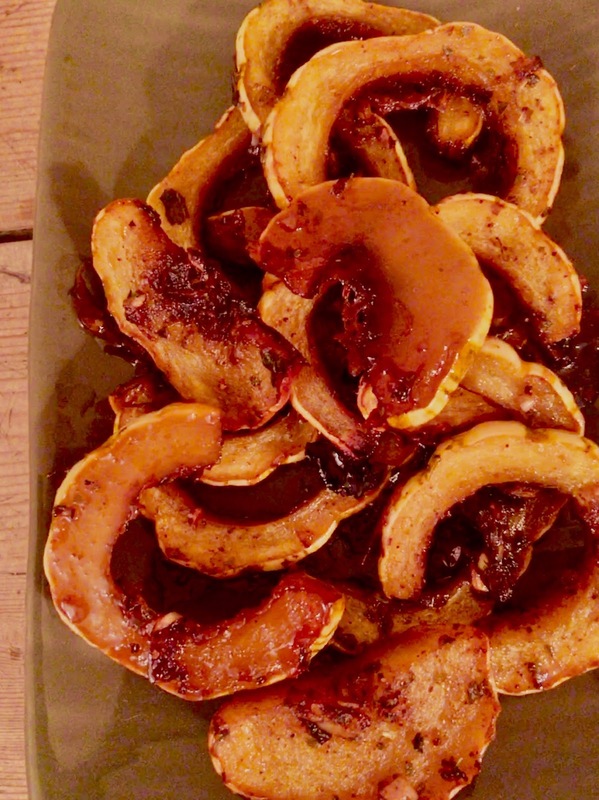 Another roasted winter squash recipe? Really? How many does a home cook really need? I hear you. Really I do. But I just know you're going to fall over for this--and maybe want to add it as a Thanksgiving side. Yeah, it's that good. 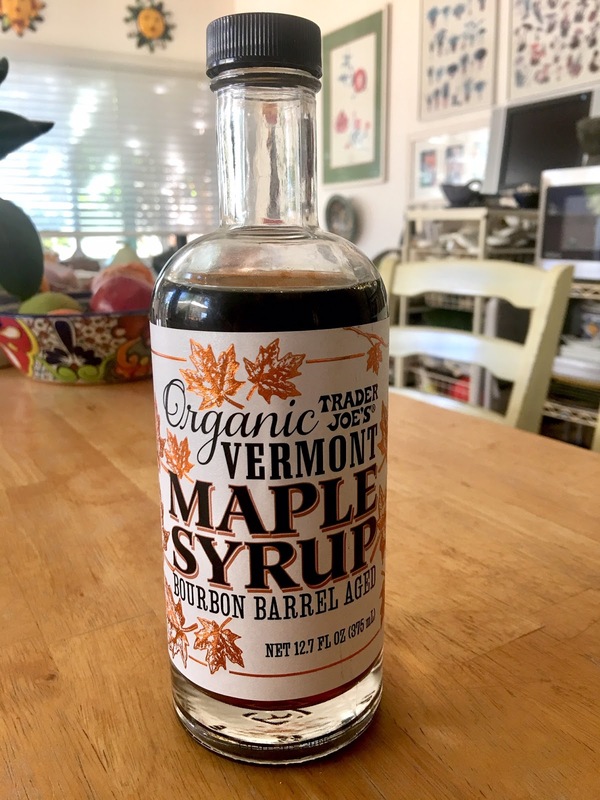 My inspiration was a bottle of Trader Joe's Organic Vermont Maple Syrup, Bourbon Barrel Aged. I admit it. I was lured by the Fearless Flyer's description and bought a bottle within the week. Then it sat in my pantry until I picked up a Delicata squash last week. I love this squash. It's already sweet, the skin is tender--even the seeds are delicious roasted. I literally stood and stared at it the other night, willing inspiration. And it hit. I peeled and minced a couple of cloves of garlic, pulled out some dried Greek oregano and Chimayo red chile powder, which has a smoky heat I love (you can use regular chile powder if you can't easily access this), and ground some sea salt. Next I pre-heated my oven to 400°. Then I sliced the squash in half lengthwise, cleaned the seeds and pulp out of the center, then sliced the halves crosswise into pieces about half an inch wide. I put them into a medium-size bowl, and added the garlic, oregano, chile powder, and salt. I mixed it all up with a nice helping of extra virgin olive oil, then spread the pieces onto a baking sheet lined with parchment paper. And, then, of course, came the maple syrup. I drizzled the syrup over the pieces, then grabbed a pastry brush and made sure each piece was covered in the syrup. Into the oven the baking sheet went. 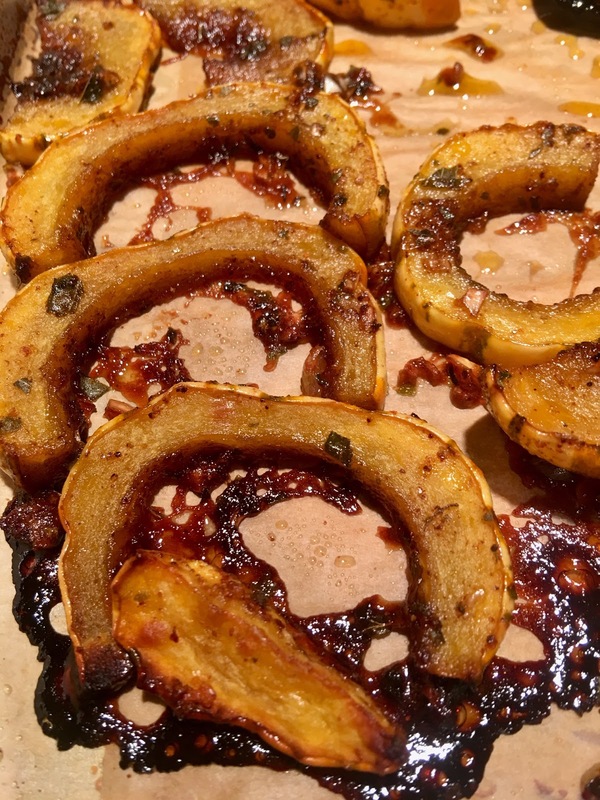 Half an hour later, the Delicata squash was beautifully browned. I popped a piece into my mouth and swooned. The syrup had permeated the squash and married with the chile powder to give a sweet, smoky heat. The garlic made sure it wasn't cloyingly sweet. It was like eating veggie candy. Slice the squash in half lengthwise, clean the fibrous pulp and seeds (save for roasting) out of the center, then slice the halves crosswise into pieces about half an inch wide. Place in a medium-size bowl. Add the garlic, oregano, chile powder, and salt. Mix together with the olive oil. 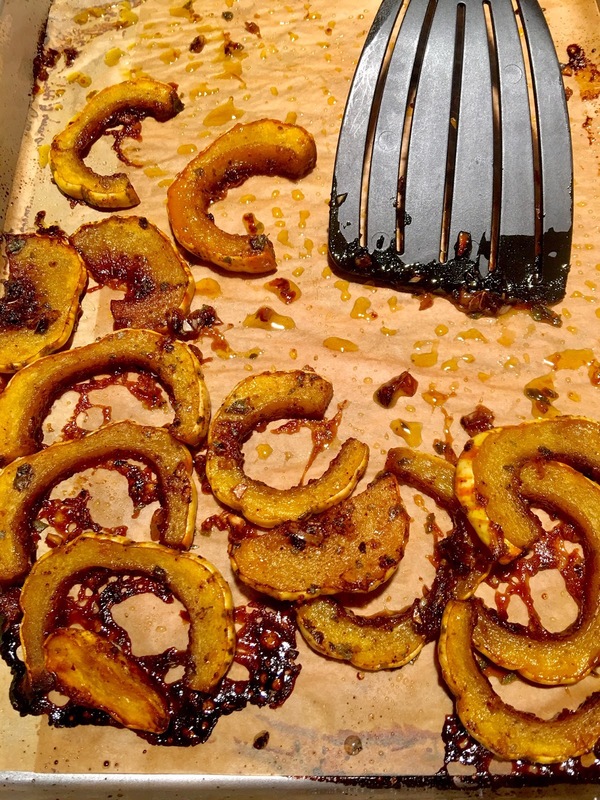 Spread out the Delicata squash slices onto a baking sheet lined with parchment paper. Make sure they don't overlap. Then drizzle the maple syrup over the slices. Use a pastry brush to brush the syrup onto each slice of squash. Place in the center of the oven and roast for 30 minutes or until golden brown. It's best served immediately, but, surprise, it's also delicious cold the next day. Catalina Offshore Products announced last week that it has been awarded a $139,700 grant from the 2018 National Marine Fisheries Service's Saltonstall-Kennedy Grant Program for a project to grow demand for opah and other underutilized and undervalued species. The project, which could be scaled to a national level, is based on a year-long project that may help increase revenue to local fleets while also offering consumers new options for locally sourced seafood. 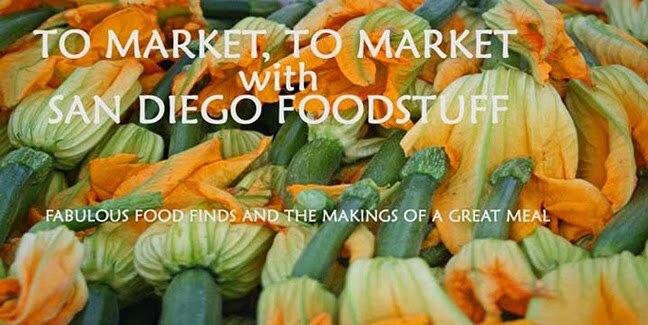 The project will consist of data collection, roundtables with fishermen and consumers, kitchen workshops, recipe development, culinary demonstrations, and an “Ocean to Table” finale event. During this public showcase, project outcomes will be presented along with a suite of dishes highlighting different culinary applications for opah, as well as other Pacific highly migratory species currently being discarded but identified through research as having market potential. 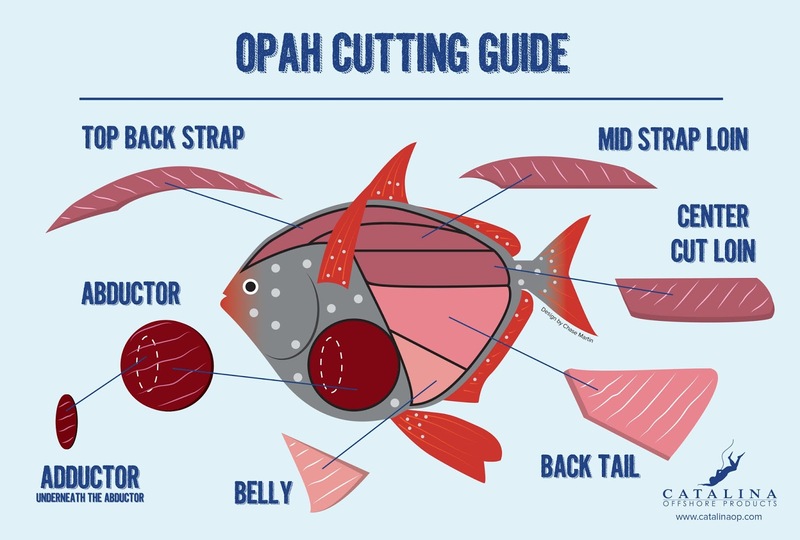 One of the reasons opah, also known as "moonfish," is an ideal subject for this project is that it is a fish that tends to be caught as incidental or a by-catch of tuna fishing. Historically elusive, Pacific opah has been showing up more frequently in recent years. 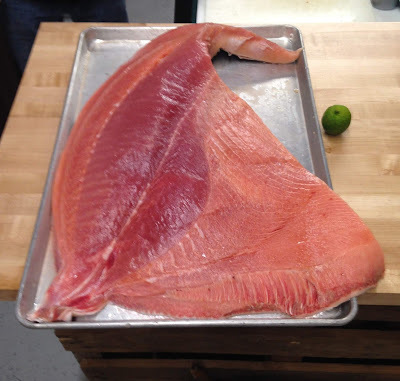 But instead of being discarded as waste, opah, which can weigh up to 200 pounds, can be enjoyed as food and represent increased profitability to fisherman, who can responsibly harvest it. There's no need to worry about overfishing it since U.S. fisheries are regulated. Another benefit is that opah can be fully utilized. 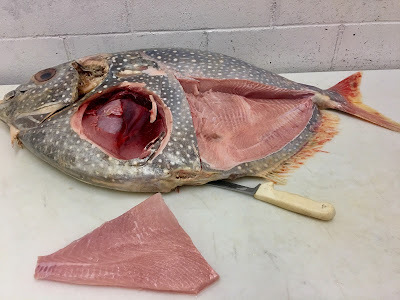 The belly, the loin, the top back strap, and the adductor/abductor make up most of the fish, and all have unique colors, flavors, and textures and, consequently, unique applications. This is rare; the flesh of other fish species tends to be the same throughout the fish. Below you can see the belly and back tail removed to the right and the section on the left that held the lean scarlet abductor (affectionately called the "tri tip" at COP). The adductor is below the abductor and with its elongated shape, is known as the "tenderloin" given that it looks like a beef or pork tenderloin. The belly is a pale pink and very fatty--and utterly delicious. So, what it comes down to educating the public. Instead of choosing what we already know and buy too much of--salmon, tuna, swordfish, and halibut, for example--we should open our minds to more options that would take pressure off those fisheries. And, as Tommy Gomes of Catalina Offshore Products, says, "The big picture is to get people to eat beyond the fillet, which is only 20 percent of a fish." Opah, which is sustainable and versatile, is one of those options. It's also not "fishy" tasting; instead basically a blank canvas for how you want to flavor it. It's also a leaner, healthier protein than red meat--and, when cooking up the abductor, can be used in many of the same applications as red meat. 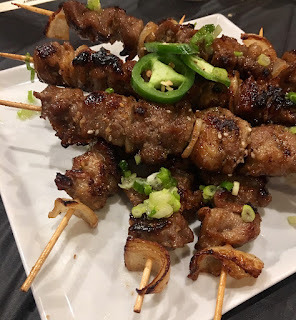 Steak, meatballs, tacos, sausage, and skewers just skim the surface. 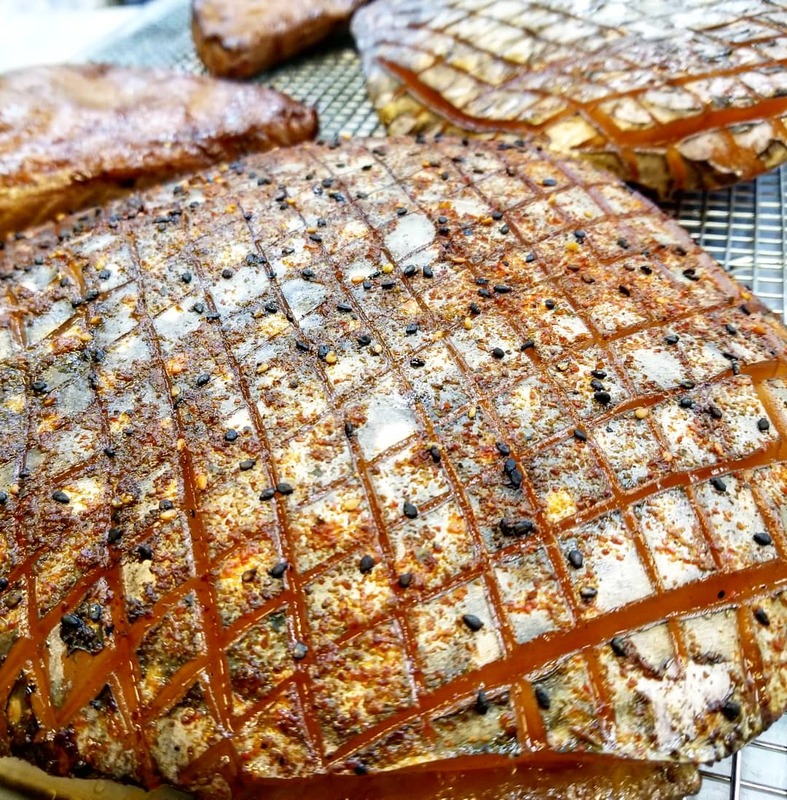 San Diego chefs have understood the value and potential of opah for quite awhile. Big fans of opah include Davin Waite of Wrench and Rodent Seabasstropub and Rob Ruiz of The Land and Water Company. The two are engaged with Catalina Offshore Products in the project. Gomes first encountered opah back in the early 1980s as a fisherman. Working with Koreans, he found that they served the fish pickled, then barbecued on deck, served on skewers with kimchee and rice. "For them it was just an edible piece of meat," he recalled. 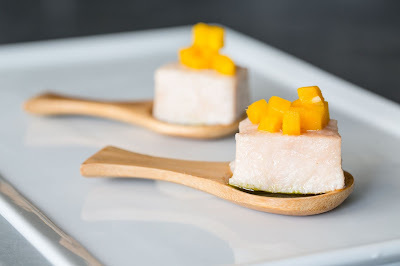 So, imagine dining on this poached opah belly made by chef Nick Brune. 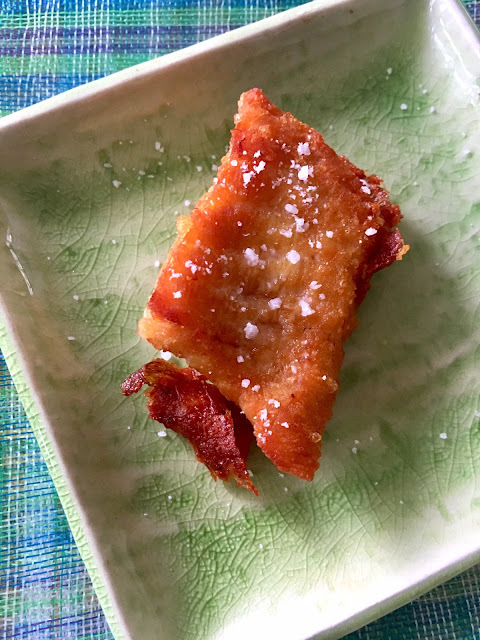 Or, this slab of opah bacon togarashi. I sliced a piece of the belly and fried it in peanut oil until both sides were a golden brown, then sprinkled it with sea salt. It was like the best fish stick you could imagine--moist and succulent. You can also turn the belly into chicharones. Or grind it with the abductor meat to make a full-flavored burger, meatballs, or meatloaf. 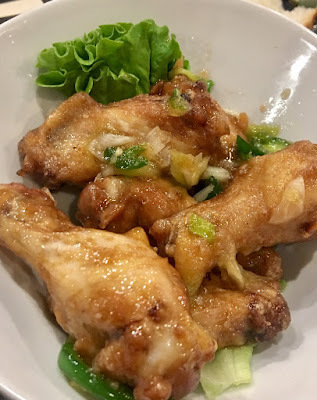 As for the abductor, I cut a portion into pieces and stir fried them with garlic, hoisin sauce, and garlic chili sauce. I had some leftover shrimp chow mein from lunch at Steamy Piggy the day before. So I emptied that into the wok with the opah to heat up for a more protein filled dish. Mitch Conniff of Mitch's Seafood in Point Loma, said Gomes, makes corndogs with opah. Chef Miguel Valdez makes opah carne asada and burgers. Still not sure? Then catch one of Gomes' demos on Saturdays in the Catalina Offshore Products parking lot. Catalina Offshore Products is located at 5202 Lovelock St. in the Morena district.